Gaza, עזה, was an ancient gateway to Palestine on the road to Egypt. It was established by Cananites who called the city Gaza around the year 3000 BCE. The city Gaza was occupied by Egypt around the 15th century BCE, who established a garrison there. The Philistines settled the area several hundred years later, and it became one of the chief cities of the Philistines. It is the location of the famous biblical story of Samson and the Philistines. It was one of five Philistine cities along the southern coast that successfully resisted Israelite conquest until Judah Maccabee's brother Jonathan captured it [ca 150 BCE]. From the early 1800s, Gaza was culturally dominated by neighboring Egypt. Though Gaza was part of the Ottoman Empire, a large number of its residents were Egyptians (and their descendants) who had fled political turmoil. Samael, who is the fire of Gehenom, is appointed over the nation of Esau, and Serpent is appointed over the nation of Ishmael, and this is [The angel] Rahav, who is in charge of the waters. 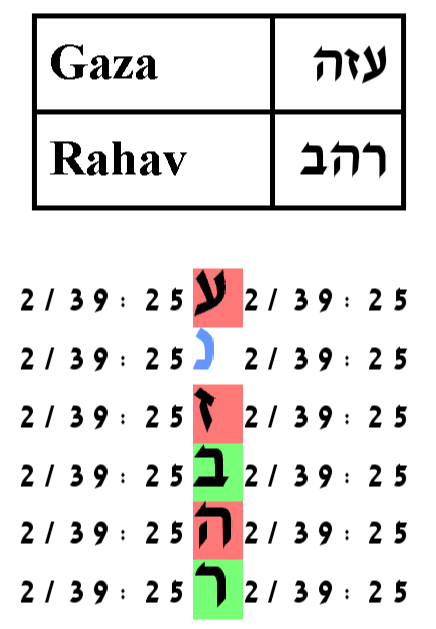 As stated in the Zohar, Rahav is also the ministering angel of Egypt. As Gaza is Ishmael with a heavy influence from Egypt, there has to be a close connection between Gaza and Rahav. The name Gaza as well indicates a relationship to the evil angel Samael, who is the ministering angel of Esau and who in the end of days will work together with Rahav, the ministering angel of Ishmael, against Israel. To see this, spell out each letter of עזה fully, עין זיין הא. Now take the concealed part, the inner letters, ין יין א and compute its gematria. The total is 60+70+1=131, which is the gematria of סמאל, Samael. Rabbi Glazerson interprets this to mean that it is the evil that we permit to exist in this world that provides the basis for Gaza's existence. One of the most active centers of activity of the people Ishmael against the people Israel is in Gaza. Therefore, it is natural to pair the key word Gaza with Rahav, the ministering angel of the people Ishamel and to pair Gaza with Samael or The Samael, who in the end of days works with Rahav against the people Israel. The pairing of Gaza with Rahav produces a statistically signficant result. 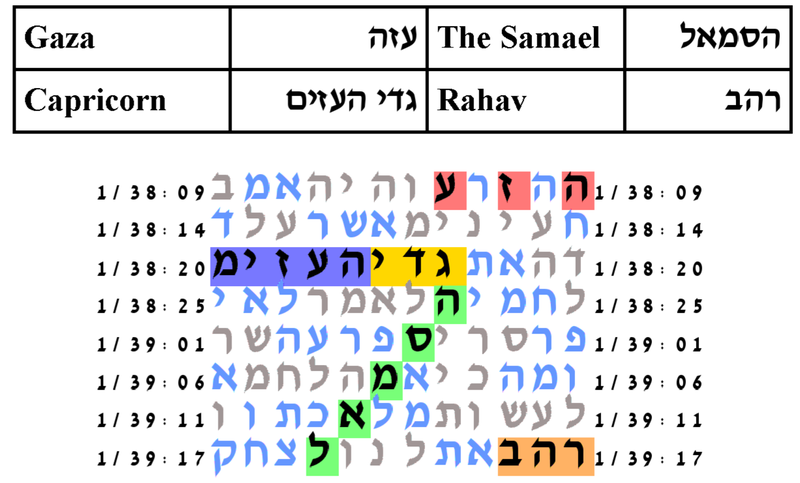 Setting the expected number of ELSs to 40, the probability that a text from the ELS random placement text population would have a table as area compact as that produced by the Torah text is 11/1,000. The expected number of ELSs is set to 40. The cylinder size is 2 columns. The probability that a text from the ELS random placement text population would produce as small a table as this is 11/1,000. None of the meetings with Samael were statistically significant. Nevertheless, we show the tables as a matter of interest to document what we have done. Because the configurations are geometrically compact, these areas may contain ELSs of other related key words that can be searched for in a future study. The expected number of ELSs is set to 200. The cylinder size is 12 columns. The probability that a text from the ELS random placement text population would produce as small a table as this is 165/1,000. 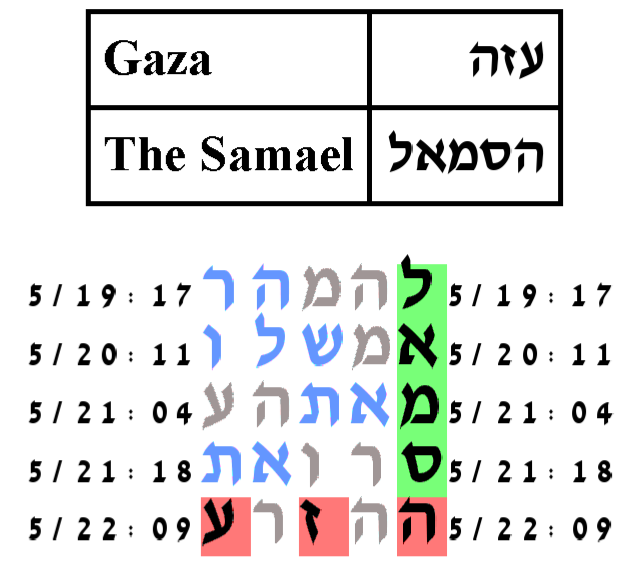 This table is interesting in that there is a ב that preceeds עזה Gaza, giving the table the meaning that Samael is in Gaza. The expected number of ELSs is set to 200. The cylinder size is 804 columns. The probability that a text from the ELS random placement text population would produce as small a table as this is 145/1,000. 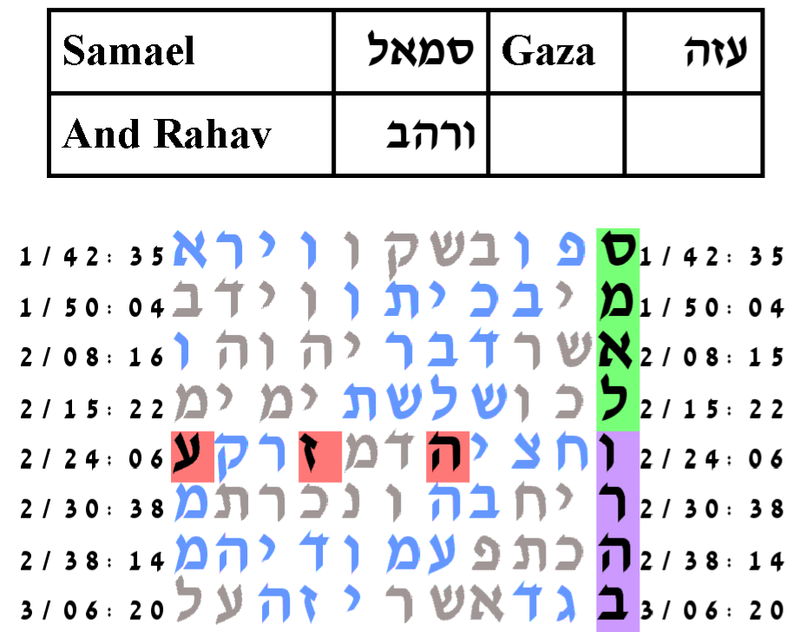 Pairing the key word phrase Samael and Rahav with Gaza and setting the expected number of ELSs to 20, the probability that a text from the ELS random placement text population would have as compact a table as that produced by the Torah text is 41.5/1,000. 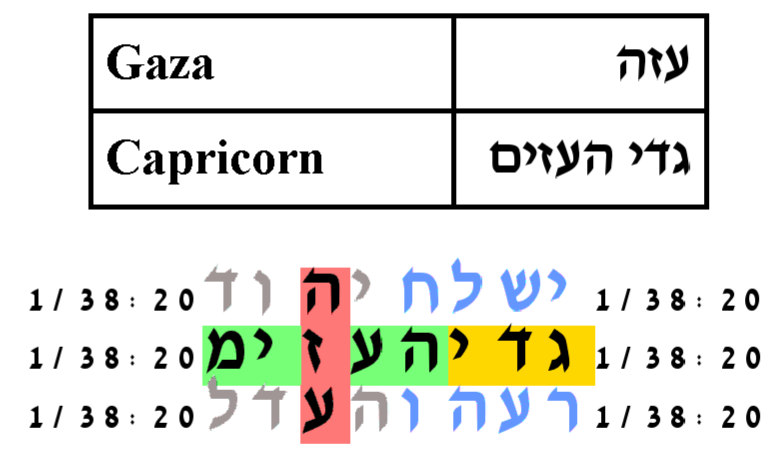 The Zodiac sign that is associated with Gaza is Capricorn, גדי העזים. Pairing the key word Capricorn with the key word Gaza and setting the expected number of ELSs to 200, the probability that a text from the ELS random placement text population would have as compact a table as that produced by the Torah text is 14.5/10,000. 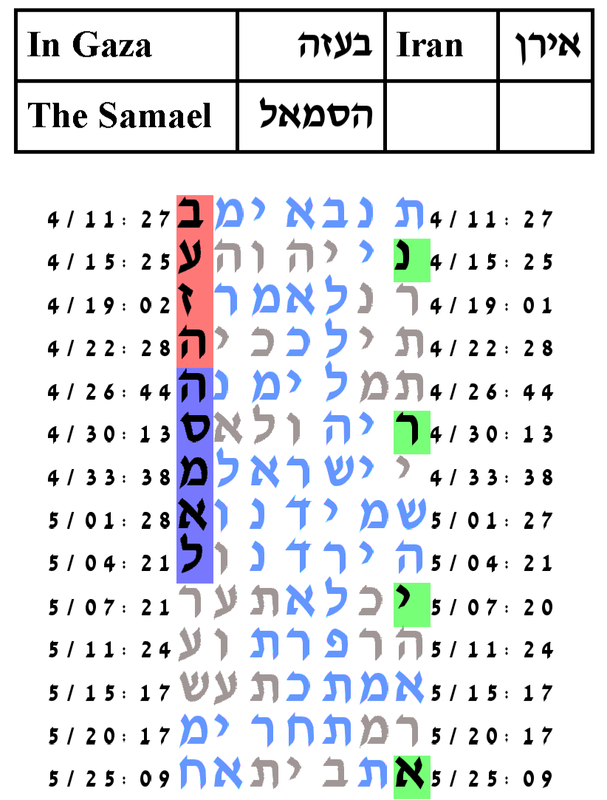 Next we try to use all the key words together: Gaza, Capricorn, Samael or The Samael, and Rahav. The table was statistically significant with the key word The Samael. Setting the expected number of ELSs to 60, the probability that a text from the ELS random placement text population would have as compact a table as that produced by the Torah text is 1.5/10,000. Since the January 2006 Palestinian election, Hamas has been the dominant political force within the Palestinian government. We pair the key word phrase Samael Hamas with their financial sponsor Iran. For Iran we use two alternative spellings and the old name Persia. The most significant of the three combinations was with Persia. 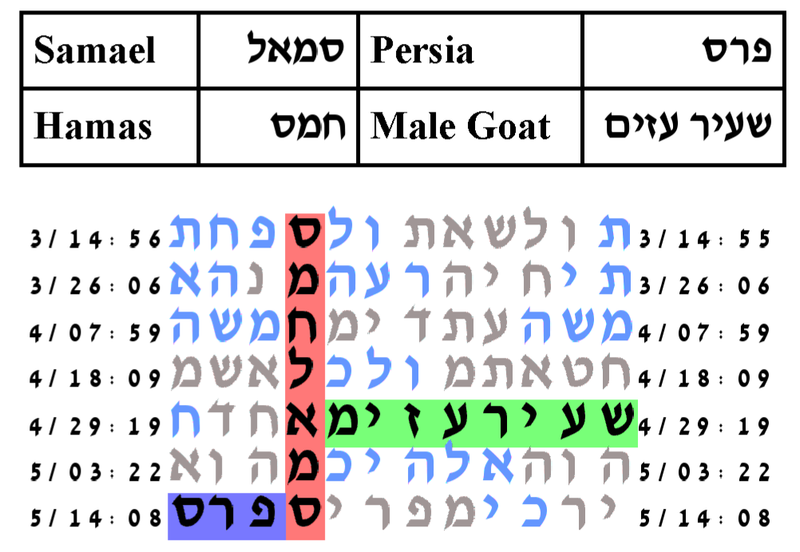 And with this combination, there is an interesting ELS of the key word Male Goat, the goat being related to the zodiac sign Capricorn, the constellation associated with the Philistines who are the spiritual ancestors of the Palestinians. There is an interesting extension to one of the ELSs of The Samael that arises when the expected number of ELSs is set to 40. The extension is an ELS of the key word In Gaza. The meaning of the combined ELSs is that In Gaza is the Samael. And as a bonus when the table is enlarged to see the above verses, then in the enlarged table is an ELS of Hamas! The ELS for The Samael arises when the expected number of ELSs is set to 40. The cylinder size is 6171 columns. We do not have a program that can properly determine a p-level for an extension. With the current software, we set the expected number of ELSs to 5000 so that the ELS extension in Gaza will arise. In this case the configuration is a geometrically minimal configuration and the probability that a text from the ELS random placement text population would produce as small a table as appears here is 4.5/1,000. If a proper experiment were to be performed using an extension protocol, we believe that the p-level would be far smaller than 4.5/1,000. The table has one more interesting ELS: an ELS of the key word Iran. This ELS has a skip that is an exact integer multiple of the In Gaza is the Samael ELS. Iran is the country financially supporting and directing the terror of Hamas. The cylinder size is 6171 columns.